What’s the baddest race car at Bonneville Speed Week 2010? If you asked 100 people, you might get 90 different answers. (Where does he come up with that crap?) 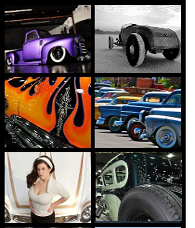 Who cares what you think, it’s my website, so I’m posting what I think are the baddest rides on the salt. From there, lets discuss… this is an interactive magazine, not some glued together pile of pages sittin’ in your bathroom! Interact and leave a comment below. That long enough for you? I found out from Tom Burkland (more about him later) tuner and friend to George that the competition coupe rules allow for some slight modifications to the stock body… the SCTA rulebook states: “Production coupe or sedan body unaltered in width or contour.” But what they don’t say is, from the cowl back. From the cowl forward, anything goes! The car can be as long as you like as long as the engine only has a 50% setback. Contrast this modern day racer to the origins of the class like the Chrisman Bonneville Coupe and the Pierson Brother Coupe. Those are both competition coupes, too. The class is E/BFCC which gives this nasty coupe a 184-260 cubic inch engine. George is running a 255″ Rodeck this year. The B = BLOWN and the F = fuel which could be anything really, but is not the spec racing gasoline of the G category. I’m not sure what these guys were running, but I’ll try to find out. With the zoomies and the thump it made, I wouldn’t be surprise to find some nitro mixed in! Here’s a closeup of George. Note the Blue hat that says “200 mph Club, Life Member”. While that’s true, George’s blue hat means he’s in a special club within the “Tw0-club” called the “Three-club” where you’ve broken a record at over 300mph. An elite club no doubt since how many people have ever gone 300mph? George first hit the 200mph club at 231.285mph in 1990, then bumped that up and squeaked into the blue hat-ville at 300.509mph. Here’s the starting line at Bonneville Speed Week 2010. See that guy in the blue shirt and cowboy hat? That’s Tom Burkland. Remember the 2 and 3 club? Tom’s a member of the 300mph club and could be a FOUR club member soon. Tom currently holds the at FIA Cat. A, Group I, Class 11 flying mile International record at 415.896 MPH! (more info here) Think he knows what he’s talking about? If you ever get a chance to, say hi and you’ll learn Tom knows his land speed racing, but is super generous with his knowledge. Tom comes from a family of Burkland land speed racing records. Tom’s father Gene (two-club at 255mph) recently passed away but is still celebrated by his son and wife Betty Burkland. Betty’s a 200mph club member too and know what’s the coolest thing? She is the current record holder in the E/BFCC category this car races in at 263.887mph. Look for a story on Betty and other women of the 200mph club soon from GreaseGirl. One last look at this super bad race car! This is also a good look at the painted on front wheels and spun aluminum discs. Tom told me covering the front wheels is aerodynamically essential to running fast. The wheel covers in the back help too, but they come off at speed like a murderous pizza pan! Tom explained that the aluminum expands until it rips the fasteners out so they need some steel covers. Damn that’s fast! Coming up for other baddest race cars: A pair from George Poteet: Speed Demon and Blowfish. From there, another Tom Burkland assisted race car, an air slicing competition coupe made from a 1960’s Saab 96. It’s nasty! So what’s your pick for baddest race car at Bonneville Speed Week 2010? Agree with me? I’d sure like to know. Here’s the MyRideisMe.com pick for Baddest Bonneville Race Car #2 a 200mph Flathead Streamliner. For more Bonneville Speed Week Records, Pictures and Coverage click this link. Where is the Hanna built car??? Hey Collin, forgot to mention that one! Tom Hanna built the Maro Special owned by Bobby Moore. I’m dying to write about that streamliner and about Bobby’s record holding 275mph Corvette. Both bad machines no doubt! Thanks for the reminder! According to the SCTA site, this Burkland coupe went 268MPH, new record! Hi Bobby, thanks for your comment and time you spend talking with me on the salt. I’ve got the Maro Special calendar hanging in my office! Your vette and the streamliner will be part of my baddest race car series… 264mph in AA /FMS to bump the record by about 3mph? Probably your record anyways! I’ll buzz you if I have any questions on the story about you. Thanks! World of Speed update! Dallas Volk just called and said the Trackmaster with a blown fuel 4 cylinder Hemi (only has 4 pistons in the motor) with 255ci and running in the E/BFCC just went 308 MPH on a 260 something record! That’s FAST! Dallas says they wanted to go over 300 and show people that the Blowfish is not as impressive. haha I think they achieved that today. Ther is a cool video of Tom Burkland on the saltflats.com page. Link is near bottom. Over 450 mph.